Recently our Founder was making a trip to Florida and she went looking for some reading material in one of the many magazines shops that all airports have. Without question she was drawn to the TIME magazine publication with a gigantic marijuana leaf on the cover. What she was not expecting was to find Primal Therapeutics on page 94! But there she and Primal Therapeutics were, locked in history in TIME magazine. 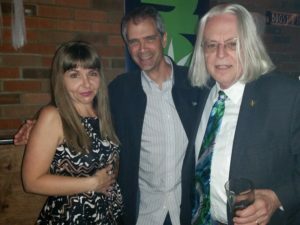 Primal Therapeutics was to be the world’s first Cannabis Spa however laws and regulations would not support the business model and in 2014 when the recreational cannabis industry was really kicking off our founder had the honor of meeting author, Bruce Barcott at an industry event. That chance encounter landed Jordan in a few sentences in Bruce’s book, Weed The People. 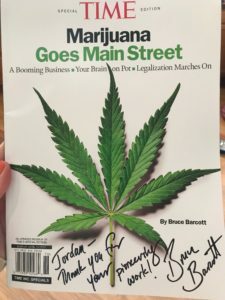 Then flash forward three years that same encounter put our founder in TIME magazine’s special edition, Marijuana Goes Main Street. It is moments and memories like this that solidify our space in this movement. It is these times that push us to keep going and to keep teaching and no matter what to remain on the cutting edge of what will become the greatest industry of all time.